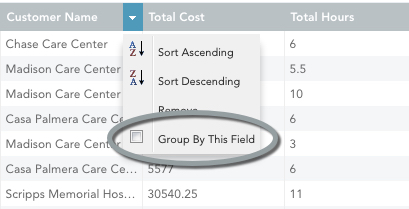 Grouping on a column will subdivide your report into groups based on the values in your chosen column. 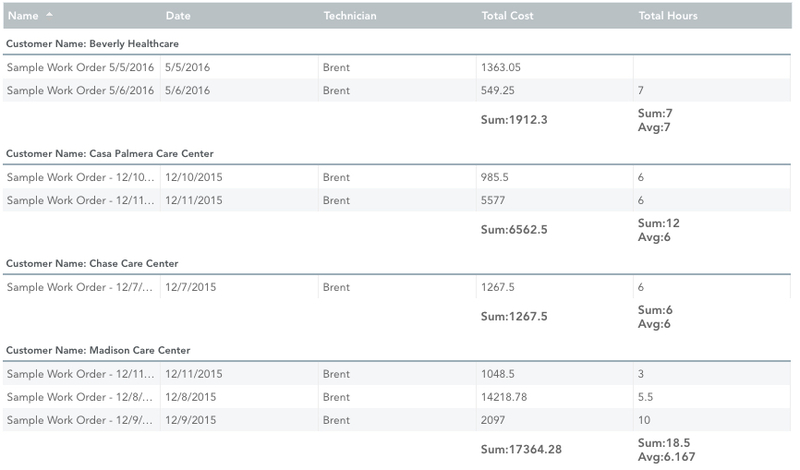 Summary Columns allow you to create columns that summarize your data in some way for each group (e.g. averaging the column data for each group). Generally speaking, grouping should be used on columns that contain some kind of category information, while summary columns should only be used for numerical data. The Total Hours column shows the average number of hours spent per job for each customer, as well as the sum for each customer. 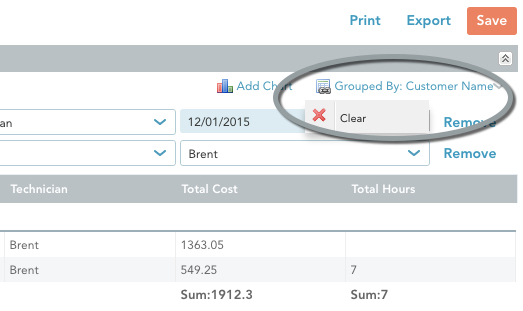 Below, we go through how to group and ungroup your columns, as well as how to create and remove summary columns. To perform any of these actions, you must first open your report in the Report Editor. To group on a column, simply hover over the column name, click the dropdown arrow that appears, and select Group By This Field from the dropdown. The report preview will immediately update with the grouping, and a Grouped By indicator will appear in the upper right. Note that you can only group the report on one column at a time. 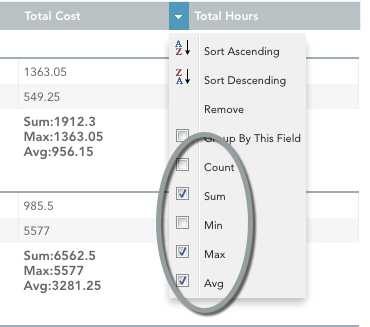 If you choose a second column to group on, your existing grouping will be ungrouped. To ungroup, click on the Grouped By indicator in the upper right, and select Clear from the dropdown. The report preview will update immediately, removing the grouping. To add a summary column, hover over the name of the column that you want to summarize, click the dropdown arrow that appears, and select one of the 5 summary choices. Note that you must group on a column first, before you can add a summary. The summary choices are as follows. Count: The number of rows in each grouping. Sum: Sum of all the values for each grouping. Min: The lowest (minimum) value for each grouping. Max: The highest (maximum) value for each grouping. Avg: The average of all values for each grouping. Notice that you can select multiple summary types for a single column. In the example below, we have selected Sum, Max, and Avg. To remove a summary column, open the column’s dropdown and uncheck the checkbox for the summary choice you want to remove.